Among the many interesting new products I saw being introduced at Global Pet Expo in Orlando this past March (Photo tour part 1, part 2), few had me more excited than some new fish foods that indicated this somewhat stagnant category might be seeing some much-needed innovation. As a hobbyist with more than just a passing interest in fish nutrition (some who have listened to me rant on the subject might just call it an obsession), I have long been dissatisfied with some of the commercially available fish food options — which, although adequate in many cases, tended not to live up to my expectations and testing on finicky wild-collected fish. With an unnecessarily large collection of various fish foods filling my freezer, under-tank cabinet space, and covering shelves in my office, I have perhaps taken the advice on offering fish “a varied diet” a bit too far. But, with some training in the science of fish nutrition and experience with their diets in the wild, I’m always looking for a food that offers a bit more than the typical flake and pellet formulations. 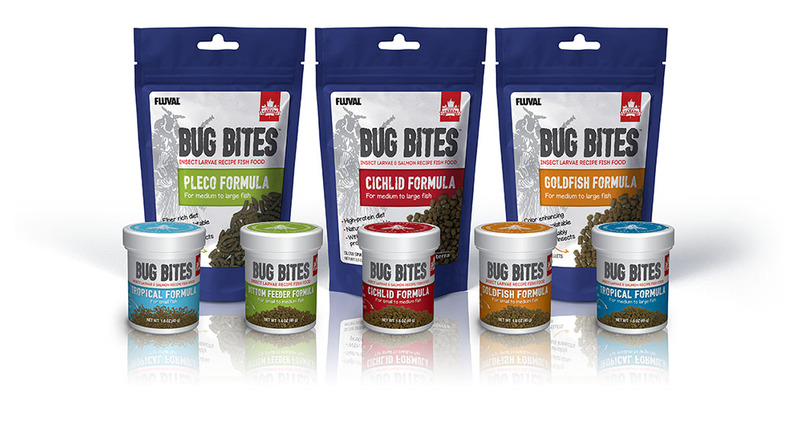 So when I was introduced to Fluval Aquatics‘ new Bug Bites line of prepared foods — which, as the name suggests, features insect ingredients as the basis of their various formulas — I was very excited for a few reasons. First and foremost, using insect meal — in this case, Black Soldier Fly (Hermetia illucens) larvae — as the main protein source is an exciting step forward for commercially available fish foods, which have traditionally relied on fish or other seafood proteins. While good quality fish or shellfish meals are undoubtedly a good, functional protein source for most feeds, the fact is that for many freshwater fish species in the wild, their diet is composed largely of insects and insect larvae. Although there is far too little in the way of published data on aquarium fish diets in the wild, from what data does exist, it is apparent that larval Chironymid flies (a close mosquito relative) make up a significant part of many Amazonian fishes’ diets — especially small-to-medium Characins, cichlids such as Apistogramma sp., Angels, Discus, and even some pleco species. Many other fish, especially the Anabantids (gouramis, Betta species) and barbs are also known for having diets high in insects and insect larvae in the wild. The Black Soldier Fly (order Stratiomyidae) larvae used in this feed has an excellent nutritional profile, is easily digested by most fish species, and has performed well in experimental trials as a partial or full replacement for fish meal in aquaculture feeds. Beyond its nutritional performance and use as a more natural protein source for insectivorous fish species, Soldier Fly larvae is noteworthy for being a uniquely sustainable ingredient as well. They have a remarkably high feed-conversion ratio, and are one of a very few protein sources that can be cultivated almost entirely using waste or compost. In manufacturing this new line of food, Fluval partnered up with Canadian company Enterra Feeds to source Soldier Fly larvae cultivated in a uniquely sustainable manner, using “unconsumed fruits and vegetables that would otherwise have gone to waste.” Given ongoing sustainability and ethical concerns with many food fisheries worldwide, an alternate protein source which doesn’t rely completely on our overfished oceans should be a welcome addition to the fish food market for sustainably-minded aquarium hobbyists as well. 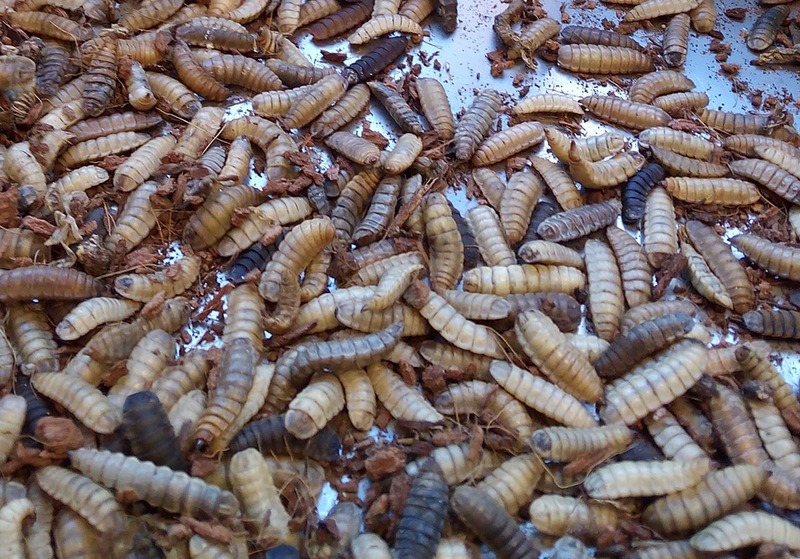 While Fluval is not the first to utilize this unique protein source for fish feed (Repashy Gel Foods, for example, uses Soldier Fly larvae or other insect meal in several of its formulations), it is probably the first large manufacturer to offer a full line of Soldier Fly larvae-based prepared foods. This looks great, when will your poor relations in the UK get a chance to try?